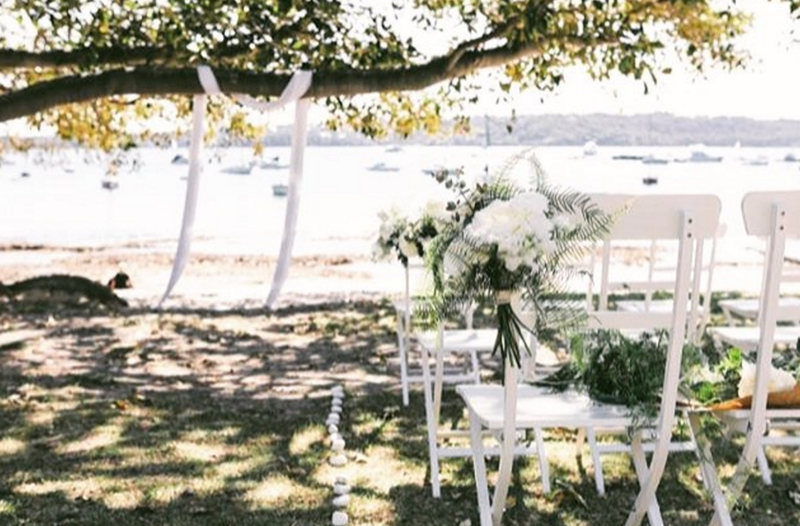 If you have decided on an outdoor wedding ceremony then nothing screams 'Beach Wedding' more then getting married on the Northern Beaches of Sydney. Featured here we have the divine wedding of JORDAN and JAIME at LUCINDA PARK in PALM BEACH. The ceremony consisted of our porch arbour with a tropical green flourish. Our wooden furniture for the seating and signing table, plus a modern outdoor bar with white umbrella's set against the boats of Lucinda Park. With the reception held at the BOATHOUSE a quintessential venue that caters for that indoor/outdoor wedding, where the smell of the ocean and sand takes the senses on a holiday. The sound of boats clanking into the evening, festoon lights guiding the way along the jetty. There really is no place like it in Sydney. Plus with AIR BNB there are loads of houses to rent close by so your guests can have a holiday or 'staycation' in their own city. The most popular setting of a Watsons Bay Wedding would have to be underneath the big Fig Tree outside Dunbar House. The beautiful arch of the branch makes a natural wedding archway that has been adorned by 100s of brides and grooms from all around the world. GIBSONS BEACH RESERVE is also a popular spot down the end of the bay. The secluded beach and park allows your wedding day to be enjoyed by your guests without any interruptions. 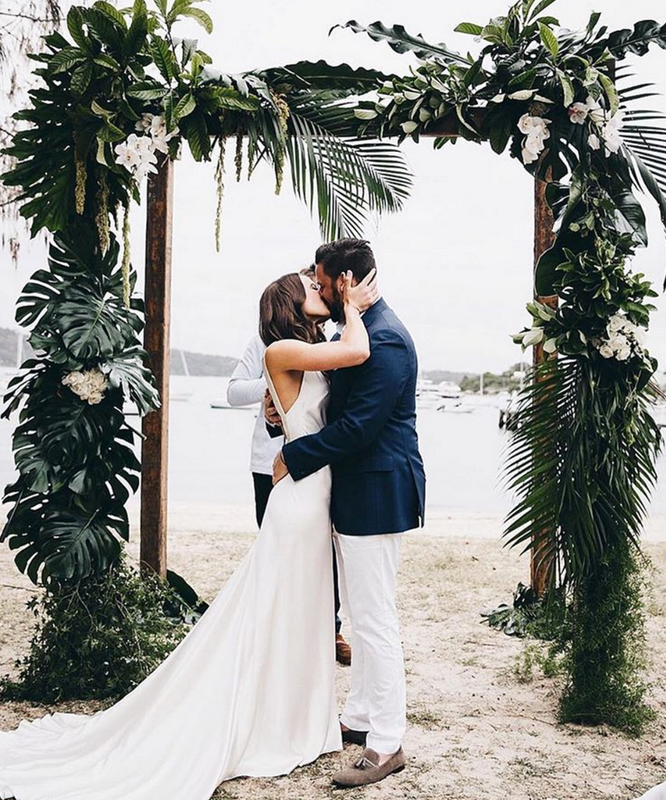 An archway can be your perfect backdrop here & adds to the setting of your wedding - like our popular TROPICAL LUXE archway we did below for ALISHA and MIKEY. If you want to be close to the city then there's no other place like the ROYAL BOTANIC GARDENS of Sydney. With the city skyline as your backdrop or Sydney harbour, the natural surroundings of a park near the city is the perfect place to host your wedding when getting married in Australia's number one city for Weddings. An outdoor bar works well here in the gardens for your guests to enjoy while you take photos. You can enjoy a toast with your guests & provides a light refreshment before heading onto your reception. Guests can arrive by ferry to your ceremony & stay at the numerous hotels that are located in the city. Our favourites would have to be the QT HOTEL, the SHANGRI-LA HOTEL AND RESORTS & the INTERCONTINENTAL SYDNEY. You can even book ahead and reserve rooms for your closest guests and receive a good rate. We would also suggest for your reception location either CAFE SYDNEY or ARIA which are relatively close by and not out of the way for your guests to get to straight after your ceremony from the gardens. HERE AT A LITTLE CHARACTER WE CAN TAKE CARE OF ALL YOUR CEREMONY & reception NEEDS. PLEASE GET IN TOUCH IF YOU'D LIKE TO DISCUSS THE OPTIONS OF YOUR NEXT OUTDOOR WEDDING. The colours of nature take on an earthy feel, with the sunsets aglow like no other. weddings, event styling & flowers. contact us now for your unique quote.